THE 2010 SOUTHERN UNIVERSITY ALUMNI HOUSTON CHAPTER MARDI GRAS BALL! 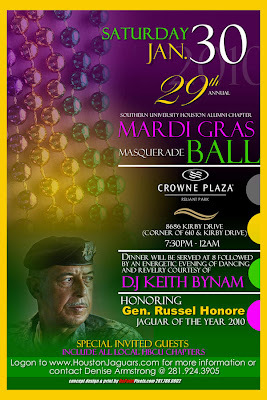 Posted in Uncategorized | Comments Off on THE 2010 SOUTHERN UNIVERSITY ALUMNI HOUSTON CHAPTER MARDI GRAS BALL! MAKE SURE YOU MAKE IT NEXT YEAR! It seems it gets better every year. 2010 was no exception for the annual Southern University Mardi Gras Ball that’s thrown by the Houston Alumni chapter. More than 700 people packed into the Crowne Plaza Hotel Saturday night for the event. It’s designed to raise money for young people who rely on scholarships to attend Southern University. Lots of familiar faces attended the event that included the 2010 Jaguar of the Year: Lt. Gen. Rusell Honore. Also congratulations to Millette Scott who took home the award for Rookie of the Year and Most Ticket Sales. The Insite hat goes off to Denise Armstrong for putting together another excellent event and including me again this year. Some of the people attending: Tony and Judge Paula Clayton, Andrill Clayton, Shawn Armstong, Don Clayton, Kevin Taylor Jarrell (thanks for some of the pictures), Karen Washington, Dennis Brown, Earl Nelson, Congresswoman Sheila Jackson Lee, LaRence Snowden, Carl Daniel, Damon Gims, Demetria Williams, Don Clayton, Tracey Taylor-Jarrell, and the list just goes on. Make sure you hop aboard for the event next year! Note: Some photos courtesy of fellow Jaguar Kevin Taylor Jarrell with the cooperation of Mrs. Tracey Taylor-Jarrell! FULL INTERVIEW WITH JANE DRAYCOTT ABOUT HER RETURN TO STATION 54! Posted in Uncategorized | Comments Off on FULL INTERVIEW WITH JANE DRAYCOTT ABOUT HER RETURN TO STATION 54! Posted in Uncategorized | Comments Off on THE FINISHING TOUCHES! IS BUN B RECORDING PANTS ON THE GROUND? on his latest mix tape. He’s preparing to release the collage of musical material to the public for free. But it won’t be released just anywhere. It’s being dropped at two of the biggest events of the year. Bun says the CD will hit the streets during the NBA All Star Week and the Super Bowl. The UGK member will likely be on the ground in Dallas and Miami when his latest creation is handed out to the public. He says there are already 27 tracks and he’s considering at least 30. And as a joke Bun B let his producer hear a beat created from the American Idol appearance of ‘Pants on the Ground.” International Red went wild. He told Bun to add that to the mix tape. At last check Bun was getting clearance from the producer so ‘Pants to the Ground’ may be one of the tracks. Keep listening for that Bun B mix tape. It should be in a CD player and Ipod near you in at least a week! DRIVERS LICENSE OFFICE IN KATY IS CLOSING! 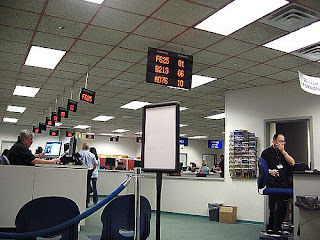 Posted in Uncategorized | Comments Off on DRIVERS LICENSE OFFICE IN KATY IS CLOSING! THERE ARE SOME ALTERNATIVE LOCATIONS! The DPS Driver License office located at 6202 George Bush Drive in Katy will close permanently at 5 p.m. on Friday, Jan. 29. DPS is seeking another location in the Katy area, but it is unknown when another office will open in the area. Until a new Katy DL office location is available, nearby driver license offices will be prepared to serve residents of the Katy area. Applications for commercial driver licenses initiated at the Katy DL office, but not completed by Jan. 29, must be completed within 90 days of application at the Houston-Gessner DL office. Parent-Taught Driver Education program participants who requested their driver education application be sent to the Katy DL office must complete their application process at the Houston–Dacoma driver license office. 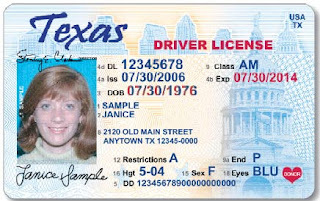 Many driver license processes can be completed online at www.txdps.state.tx.us. This website also contains other information such as DL office location and answers to frequently asked questions. WHAT A COOL WAY TO HELP THE PEOPLE OF HAITI! Posted in Uncategorized | Comments Off on WHAT A COOL WAY TO HELP THE PEOPLE OF HAITI! THIS WILL BE TOO MUCH FUN! On Saturday, January 30th, customers can take a train ride with their family and help someone in Haiti at the same time! One hundred percent of the proceeds from the tickets sold on this date will be given to the American Red Cross in their efforts to help Haiti. The diesel train excursion will depart from the Rusk Depot at 11:00am and return at 3:30pm. Customers will enjoy a lunch layover at the Palestine Depot. Ticket prices start at $19 for children ages 3-11 and $36.50 for adults 12 & over. Infants 2 and under ride free. Climate Controlled Seating & Diesel Engine Cab Ride Upgrades available. Special $10 Local Appreciation Rate applies to customers from Anderson, Angelina, Cherokee, Freestone, Henderson, Houston, Leon, Nacogdoches, Navarro, Rusk & Smith Counties. Tickets are available online at www.TexasStateRR.com or by calling 1-888-987-2461. 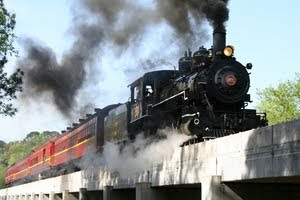 The Texas State Railroad is also challenging other businesses to join our efforts and match the funds that are raised. Businesses interested can contact Lori Pennington at (903) 683-3087. CONSERVATIVE ACTIVISTS BUSTED FOR ALLEGEDLY TRYING TO TAPE SENATOR’S PHONE LINES! Posted in Uncategorized | Comments Off on CONSERVATIVE ACTIVISTS BUSTED FOR ALLEGEDLY TRYING TO TAPE SENATOR’S PHONE LINES! REMEMBER THE FAKE PIMP IN THE ACORN STING? Wall Street Journal – An attorney for conservative activist James O’Keefe denied Wednesday that his client had sought to tamper with phones at the New Orleans offices of Democratic Sen. Mary Landrieu, after he and three other men were arrested and charged by federal officials. The men are accused of participating in a scheme Monday in which two allegedly posed as telephone repairmen and entered Ms. Landrieu’s office to tamper with the phone lines. Mr. O’Keefe, Joseph Basel, Stan Dai and Robert Flanagan were charged with entering a federal building under false pretenses with the intent of committing a felony. The men haven’t entered pleas. They are scheduled to appear in federal court in New Orleans on Feb. 12. An attorney for Messrs. Basel, Dai and Flanagan didn’t return a call for comment. Federal authorities says Messrs. O’Keefe and Dai admitted to helping conceive and execute the plan, and that Messrs. Basel and Flanagan admitted they entered Ms. Landrieu’s office posing as repairmen. 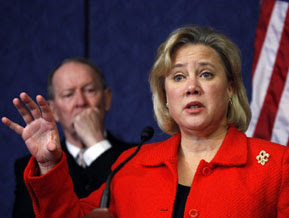 Their reasons for allegedly singling out Ms. Landrieu were unclear. All four men have significant experience as activists for conservative causes. The common link between at least three of them is Mr. O’Keefe, whose work has achieved the highest profile among them. Last year, Mr. O’Keefe, a 25-year-old filmmaker, shot undercover videos at field offices of advocacy group Association of Community Organizations for Reform Now, or Acorn, that gained national attention for purporting to document corruption. Mr. O’Keefe didn’t respond to a request for comment sent by email. Mr. O’Keefe’s father, Jim O’Keefe of Westwood, N.J., said he didn’t know what to make of the situation and was looking for more information. “I believe in him. 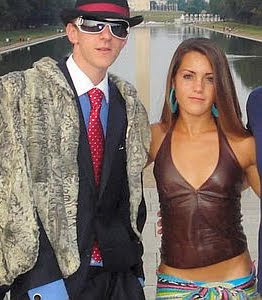 He’s an honest kid, a good kid, and he’s trying to uncover the facts,” Mr. O’Keefe’s father said. People who know the accused men describe them as earnest in their convictions and honest in pursuing them. But some suggested that, if the allegations are true, they might have gone too far Monday. “I am shocked by the reports of this behavior,” Hannah Giles, who collaborated with Mr. O’Keefe on the Acorn videos, said in a statement. Ms. Giles posed as a prostitute and Mr. O’Keefe as a pimp in the footage, and together they sought advice from Acorn workers about opening a brothel. But this time, he said, it appears that Mr. O’Keefe may have overstepped. After Mr. O’Keefe graduated from college, he worked at the institute for about a year, according to Mr. Sutton, flying across the nation and training students to launch conservative publications at their campuses. He said one of Mr. O’Keefe’s trainees was Mr. Basel, then a student at the University of Minnesota’s Morris campus. With Mr. O’Keefe’s guidance, Mr. Basel used a grant from the Leadership Institute to start a conservative student newspaper, the Counterweight. Mr. Basel also was active in the College Republicans and worked on the 2006 campaign of Republican state Sen. Bill Ingebrigtsen. “I hope that the investigation is thorough and any criminal acts are punished to the full extent,” Mr. Ingebrigtsen said in a statement. Mr. Basel couldn’t be reached for comment. The 24-year-old Mr. Flanagan has worked on a contract basis for the Pelican Institute’s Web blog, according to Mr. Kane. Mr. Flanagan, who lives in New Orleans, is the son of William J. Flanagan, the interim U.S. attorney for the Western District of Louisiana. A spokeswoman at U.S. Attorney Flanagan’s office, in Shreveport, said he wouldn’t comment about his son’s arrest. Mr. Flanagan couldn’t be reached for comment. Federal authorities didn’t explain Mr. Dai’s role in the incident but said the 24-year-old helped to conceive and execute the plan. Mr. Dai, who emigrated from China and who grew up in Illinois, was a junior administrator for a federally funded program in 2008 at Trinity Washington University in Washington, D.C., that exposed students to potential careers in intelligence in the aftermath of the Sept. 11, 2001, attacks. Ann Pauley, a spokeswoman at Trinity, said Mr. Dai stopped working at the school when the grant ended, in October 2008. Mr. Dai couldn’t be reached for comment. WILL YOU GO OUT AND BUY THE NEW APPLE IPAD? Posted in Uncategorized | Comments Off on WILL YOU GO OUT AND BUY THE NEW APPLE IPAD? RANGES FROM $499 TO $800! The iPad is controlled with a 9.7-inch, touch-sensitive screen, and it heralds a transition from using a mouse and a keyboard for typical computing tasks to touching, tapping and gliding your fingers on a silky glass screen. Anyone who owns an iPhone or iPod touch, Apple’s other devices with a so-called “multitouch interface,” knows how wonderfully intuitive and intimate the experience can be, especially when compared to a hulking desktop machine. It might be easy to dismiss the iPad as a toy — as nothing more than an oversized iPhone or iPod touch — and certainly it won’t be sufficient for many business professionals, especially those requiring specialized software or big screens, at least it its current incarnation. 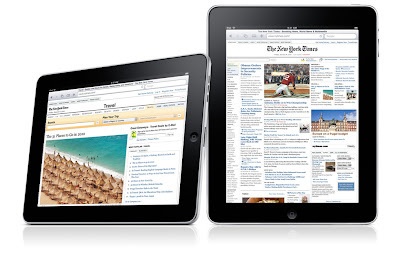 The iPad may also be a lifeline for struggling media companies — in particular, book publishers, newspapers and magazines. That’s not because the iPad introduced any magical way to sell their content, but because millions of consumers will have an all-purpose computing device they can hold in their hand and display soon-to-be-invented ideas of what books, magazines and newspaper can be. That “soon-to-be-invented” part is the key, as it remains an open question whether slow-moving media organizations will have the business acumen, as well as the creativity and resources, to deliver wow-inducing publications (think video and audio, as well as easy ways to annotate and share content) that readers will be willing to pay for. With an iPad magazine (or, for that matter, a book or newspaper), you’d be getting far more than text. A magazine-like layout would be interactive, controlled with your fingers. Tap the screen, and a video clip starts to play. Touch a photo, and it zooms to fill the screen. Glide your fingers along the screen to move from page to page. Activate the microphone, and you could add an audio annotation. And you’d be holding this in your hand, just like a “real” magazine. That will be worth plunking down the cost of a subscription. But it’s the “touch” that really sets the iPad apart. A computer, even a lightweight notebook computer, always feels somewhat cumbersome. But a touch-screen interface feels natural, like it’s an extension of you; it’s more akin to holding a book, or a pen and notepad, than operating a computer. And that’s a meaningful, even revolutionary, change. BOOTLEGGERS FACING SOME HARD TIME AND BIG FINES FOR PIRATED MOVIES! Posted in Uncategorized | Comments Off on BOOTLEGGERS FACING SOME HARD TIME AND BIG FINES FOR PIRATED MOVIES! THE FEDS BUST UP A DALLAS OPERATION WITH OKLAHOMA TIES! Robert Campbell, Jr., pleaded guilty today before U.S. Magistrate Judge Paul D. Stickney to an indictment charging one count of copyright infringement and aiding and abetting, announced U.S. Attorney James T. Jacks of the Northern District of Texas. Campbell, 26, of Tulsa, Oklahoma, faces a maximum statutory sentence of five years in prison, a $250,000 fine, and restitution. A sentencing date has not been set. He remains on personal recognizance bond. Campbell’s co-defendant, who is his father-in-law, Osborne Lowe, of Dallas, is also charged in the indictment with the same offense. Lowe was arrested on November 24, 2009, on charges in an indictment that was returned by a federal grand jury in Dallas and unsealed that day. Lowe remains on personal recognizance bond and is scheduled to go to trial on March 15, 2010. On February 15, 2008, special agents with the FBI executed a search warrant at the business “Movies and CDs,” which was located at 9009 Bruton Road, Suite 101, in Dallas. At the time, Campbell worked for Lowe, who owned the business. While working at “Movies and CDs,” Campbell frequently worked alone and would either open or close the store. Customers would place orders for copies of movies, which Campbell burned onto DVDs while they waited. Campbell gave customers the pirated movies, which he placed into white sleeves, in exchange for their payment of five dollars per DVD. Campbell admitted that during a six-month period, ending the date the search warrant was executed, he assisted in the pirating of more than 151 movies, including: Bee Movie, Beowolf, Brave One, Gone Baby Gone, Michael Clayton, Rendition, Why Did I Get Married, Rambo, 27 Dresses, and Mad Money. These movies had theatrical release dates from September 7, 2007, through January 25, 2008, and DVD release dates ranging from January 1, 2008, through May 13, 2008. The case is being investigated by the FBI and prosecuted by Assistant U.S. Attorney Aisha Saleem. YOU’RE CHANCE TO SEND A STUDENT TO COLLEGE AND HANGOUT WITH THE GENERAL WHO LEAD THE HURRICANE KATRINA RECOVERY EFFORT AND NOW A CNN ANALYST! Posted in Uncategorized | Comments Off on YOU’RE CHANCE TO SEND A STUDENT TO COLLEGE AND HANGOUT WITH THE GENERAL WHO LEAD THE HURRICANE KATRINA RECOVERY EFFORT AND NOW A CNN ANALYST! CONTACT THE INSITE FOR TICKET INFORMATION! The event is this Saturday at 7pm. It will be held at the Crowne Plaza near Reliant! HARRIS COUNTY TEJANO DEMOCRATS ANNOUNCE ENDORSEMENTS FOR 2010 DEMOCRATIC PRIMARY ELECTION! Posted in Uncategorized | Comments Off on HARRIS COUNTY TEJANO DEMOCRATS ANNOUNCE ENDORSEMENTS FOR 2010 DEMOCRATIC PRIMARY ELECTION! The membership body of the Harris County Tejano Democrats (HCTD) met on January 14, 2010 to vote on the organization’s candidate endorsements for the March 2, 2010 Democratic primary election. The membership agreed to endorse all unopposed Democratic candidates running in the 2010 primary, while the attached list provides the names of the HCTD endorsed candidates in opposed Democratic races. “We look at the quality of each individual, and we endorse and support candidates we feel best represent our membership and community,” stated Guadalupe Navarro, Chair of the Screening and Endorsement Committee. “We are proud that so many candidates seek out the endorsement of the Harris County Tejano Democrats, and we believe that our involvement in the political process helps our members, as well as others in the community, make better decisions at the polls,” Mr. Navarro added. Harris County Tejano Democrats is a grassroots organization dedicated to increasing political awareness and activism in the community. The organization’s purpose is to seek full representation of Hispanics at all levels of government. This includes screening, endorsing, and supporting candidates who best represent Democratic principles and Hispanic interests. HOUSTON TEACHERS GET BONUSES LIKE ATHLETES WEDNESDAY! 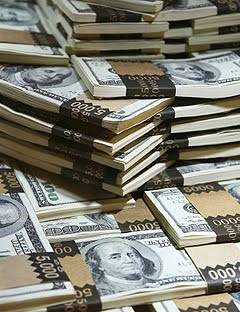 Posted in Uncategorized | Comments Off on HOUSTON TEACHERS GET BONUSES LIKE ATHLETES WEDNESDAY! IS THIS THE MOTIVATION NEEDED FOR GOOD TEACHERS? More than 15,000 HISD teachers, principals, instructional and non-instructional staff will receive performance pay totaling $40.4 million tomorrow for helping children improve in the classroom. This exceeds last year’s payout by approximately $8.8 million. On Wednesday January 27th at 10 a.m. Superintendent Dr. Terry Grier will visit Burbank Middle School (315 Berry, 77022) to congratulate one of three teachers in the district to receive the top dollar amount. Employees at Burbank are receiving more than $560,000 in bonuses. The ASPIRE awards program model divides growth into four groups known as quartiles. There was significant growth in all the quartiles for the 2008-2009 school year. Of the 270 HISD campuses with value added scores, 224 (83 percent) had statistically significant growth across all grades and subjects. “For those teachers who did not receive an Aspire award this year, it doesn’t mean their students or their campus didn’t grow academically, it just means that their performance wasn’t in the top 50 percent for last year,” says Assistant Superintendent for Research And Accountability Carla Stevens. Prior to Wednesday’s payout, every teacher was given access to a special online website where they could see their estimated bonus amount and information about the value-added scores that led to the calculation of the bonus amount. That gave employees plenty of time to check the information and ask questions or raise concerns. Non-instructional staff at schools, including teacher aides and clerks, also had a chance to take part in the performance pay program. 3951 non-instructional staff members at schools earned bonuses ranging from $25 to $1870. HISD launched the teacher performance pay program in January 2007 as a way of identifying and rewarding teachers for strong academic growth by children and as a tool for recruiting and retaining the best teachers. Since 2007, HISD has awarded over $113 million in teacher performance pay. THE SAINTS HEADING TO THE SUPER BOWL! Posted in Uncategorized | Comments Off on THE SAINTS HEADING TO THE SUPER BOWL! AFTER 43 YEARS THEY’RE GOING TO THE BIG DANCE! Unheralded Garrett Hartley lifted the New Orleans Saints into their first Super Bowl with a 40-yard field goal in overtime for a 31-28 victory over the Minnesota Vikings for the NFC championship Sunday. After a battered Brett Favre threw away the game with an interception deep in Saints territory at the end of regulation, Drew Brees guided New Orleans to the Minnesota 22. Hartley, suspended at the start of the season for using a banned stimulant, split the uprights. Forget the Aints and the paper bag masks. The Saints will meet Peyton Manning and the Indianapolis Colts in the Super Bowl in two weeks in Miami.